Collected some. Was advised not to wait on the others - with this dry weather they might not grow much, just dry out. I'm thinking of pickling a pint or two - any advice? 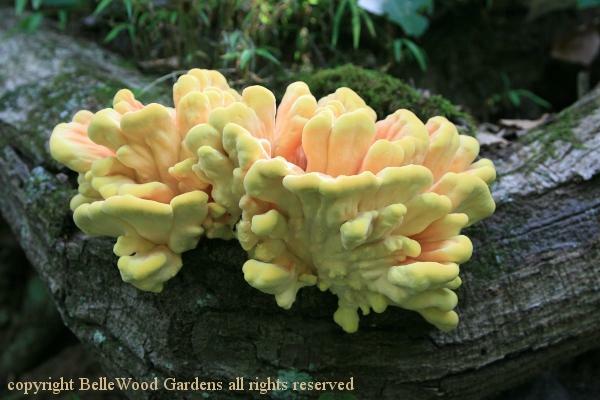 Because of the taste, the mushroom has been called chicken polypore and chicken-of-the-woods. Many people think that the mushroom tastes like crab or lobster. The authors of Mushrooms in Color said that the mushroom tastes good sauteed in butter or prepared in a cream sauce served on toast or rice. It is highly regarded in Germany and North America. The mushroom is a good substitute for chicken. Young specimens are edible if a large clear watery liquid comes out of it. The mushroom should not be eaten raw. Deer like to eat the mushroom. Some people have had gastrointestinal upset after eating this mushroom., and it should not be consumed raw. Studies have shown severe adverse reactions, including vomiting and fever, in about 10% of the population, but this is now thought to be a result of confusion with morphologically identical species such as Laetiporus huroniensis which grows on hemlock trees, and L. gilbertsonii which grows on Eucalyptus. The mushroom produces the Laetiporus sulphureus lectin (LSL) which has haemolytic and haemagglutination activities. Haemolytic lectins are sugar-binding proteins that lyse and agglutinate cells. The haemagglutination and haemolytic activity are started by binding carbohydrates. G. frondosa grows from an underground tuber-like structure known as a sclerotium, about the size of a potato. The fruiting body, occurring as large as 100 cm, is a cluster consisting of multiple grayish-brown caps which are often curled or spoon-shaped, with wavy margins and 2�7 cm broad. The undersurface of each cap bears approximately one to three pores per millimeter, with the tubes rarely deeper than 3 mm. The milky-white stipe (stalk) has a branchy structure and becomes tough as the mushroom matures. The sclerotia from which hen of the woods arises have been used in traditional Chinese and Japanese medicine to enhance the immune system. Researchers have also indicated that whole maitake has the ability to regulate blood pressure, glucose, insulin, and both serum and liver lipids, such as cholesterol, triglycerides, and phospholipids, and may also be useful for weight loss. Thank you for the thorough descriptions, dpack. I've foraged and eaten both mushrooms, numerous times, and enjoyed them very much. Have pickled mushrooms, just not chicken of the woods and was wondering if anyone here had done so. I collected some yesterday, was going to let the others grow some more. But the advice seems to be take it while young and tender. With older chicken of the woods I sautee the tender edges, braise the middle, and use the very firm base to make a mushroom flavored stock. Will collect on my way off to the farmers market this morning. Well someone else got there ahead of my return visit this morning, and collected all of the remaining chicken of the wood mushrooms. C'est la vie. I like to use it in a Thai green curry. when i pickle st george's ,boletus etc i salt them into the gills and then turn them top up on a rack overnight to dry them a bit then smoke them to dry them a bit more before pickling em in balsamic vinegar.i recon that would work well with cotw slices.